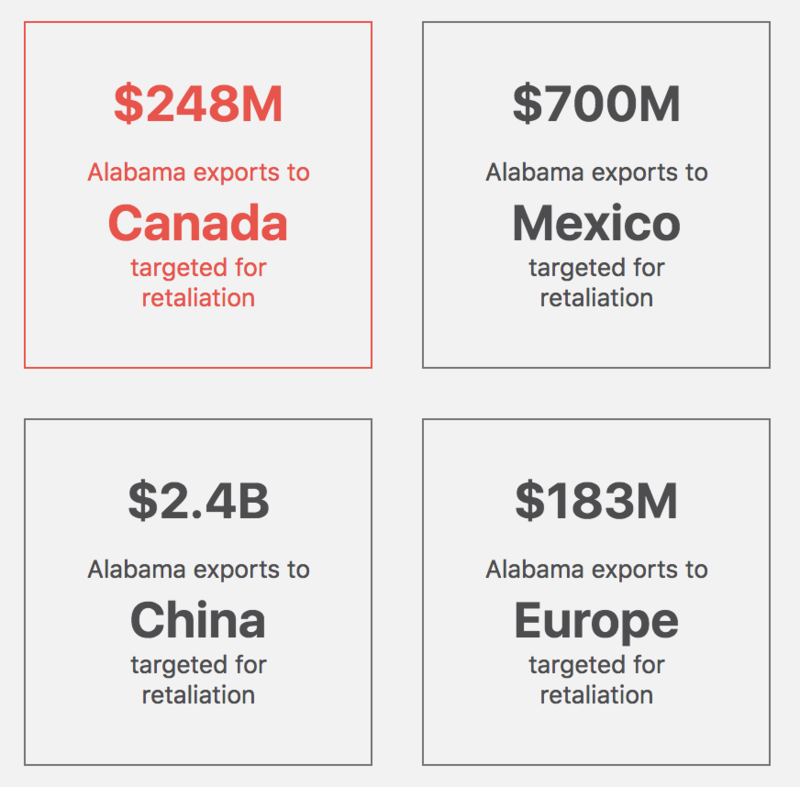 In a campaign opposing President Donald Trump‘s trade tariffs, the U.S. Chamber of Commerce on Monday released a report revealing more than $3.6 billion in Alabama exports are threatened by the President’s new tariffs. The Trump administration has targeted China, Canada, Mexico and European Union nations with large tariffs on imports, such as a 10 percent charge on imported aluminum and a 25 percent charge on steel, arguing their necessity to protect national security and to promote more domestic production. But the Chamber says the tariffs threaten to spark a global trade war as Canada, Mexico, the EU, and China have already retaliated or announced plans to retaliate with billions of dollars in tariffs on American-made products. The tariffs could also trigger job losses. The Chamber said 567,500 Alabama jobs are supported by global trade. Last week, Gov. Kay Ivey contacted U.S. Secretary of Commerce Wilbur Ross and several members of the Alabama congressional delegation expressing her concerns over the tariffs. U.S. Sen. Doug Jones is also concerned with the tariffs. “Auto manufacturers and suppliers employ nearly 200,000 of our constituents and that number is growing. These are good jobs employing American workers. Over the past several years the automotive industry, including foreign manufacturers, has invested billions in our states and created thousands of jobs,” wrote Jones, along with Tennessee U.S. Sen. Lamar Alexander.